Want Bright Nights with Outdoor Lighting in Scottsdale? With so many warm Arizona nights, most people can spend nights outside without even having to bundle up. But not being able to see is a different story. If you want to enjoy your outside landscape and architecture in the nighttime hours, you could try bringing flashlights or wearing a headlamp. 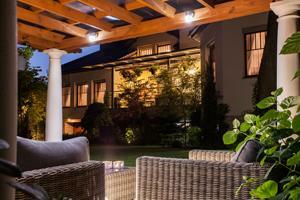 Or you could enjoy your yard in style with outdoor lighting in Scottsdale by Desert Environments. Using light as an artist would use paint, we can create fantastic effects for your evening enjoyment when entertaining at your home so you don't have to rush back in at dusk. "Shadowcasting" the sculptural effects of a cactus against a flat backdrop. "Uplighting" can be incorporated to emphasize vertical elements such as palm trees. "Downlighting" illuminates lower lying plants when skillfully hung from trees. Even if your friends and family have seen your yard in the daytime, with clever use of lighting, you can create a new eye-catching look for your landscape features. Have you recently added some plants to your pathway you want to show off? Watch them pop with shadow casting! Want everyone to see your new pond or fountain? Make them shine! Need to make sure everyone can function and cook in your outdoor kitchen? We can make it look even better than the one indoors. 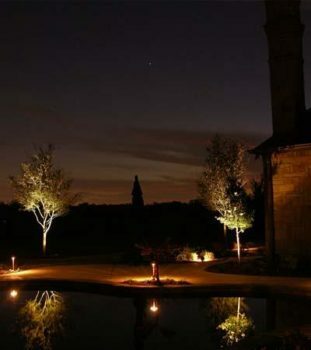 With outdoor lighting combined with a knowledgeable, experienced landscaping contractor, the possibilities are endless. And with over 25 years of experience, we're just the landscape company you need! From the free estimate to the finished product, we work with you every step of the way and do the job right the first time!